Here's a plane that I'll bet you ain't never seen before? 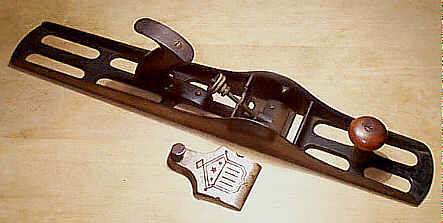 Anyone familiar with handplaning will immediately recognize the swell features of this tool, the swiss cheese of planes: 1) you don't need to drill a hole in the plane's body in order to hang it on a hook - hang holes have been conveniently designed into the tool; 2) the plane was designed to take advantage of The Flat Sole Society's mission to lap every plane on God's green planet (and this done some 100 years before the Society's founding); 3) sissy boys can brag about using an iron jointer without having the weight of the same pooping them out during use; and lastly 4) when the purchaser figures out (in 5 minutes or less) that this plane is the biggest piece of manure ever invented, he'll soon give it to junior who can then dip it in soapy water, wave it in the air, and make huge bubbles! Ok, enough dissing the plane. This thing was made in Boston, Massachusetts during the early 1870's by the Boston Metallic Plane Company. The plane was patented by Cyrus H. Hardy, with the patent granted on September 24, 1872. This example, a jointer roughly the size of a #8, is stamped with the patent date along the lower edge of the left cheek. The planes by this firm are very scarce, and with the image as proof, one should be able to see why. They are very fragile with their webbed casting, which was designed to reduce the tool's weight, and they more often than not suffered cracking during use. The webbed casting made the craftsman work all the harder to keep the plane moving at a constant speed, something that wasn't a strong selling point to Joe Carpenter of 1873. A cheap and cheesy adjusting mechanism, which almost appears as an afterthought, was provided on the plane. It's nothing but a grooved brass nut that travels on a threaded rod that terminates behind the plane's mouth. The iron, missing on this example, has a clip-like projection that engages the groove in the nut so that the iron's set can be crudely regulated. The rosewood tote is nicely fashioned and has a very slender and fragile horn. It's amazing that the one on this example survived all these years undamaged. The knob, turned of maple (the company mixed woods on their planes), threads into a boss in the casting and it sits atop a brass sleeve. This knob is almost as fragile as the plane's main casting is, being way too small for the power needed during planing. It shouldn't come as a surprise that most of the planes are found cracked/welded around the areas of the tote and knob. On a positive note, the company can be credited with providing a certain artistic flair to their tools as the nickel plated lever caps are decorated with geometic patterns. Some of the planes have a patriotic shield incised (via casting) on them. The company was one of the first to use nickel plating on their planes. And, get this - they also were the first to make a low angle block plane that's of a jack plane's length, which once again gives proof that the boys in New Britain were great copiers as well as inventors. Yes, it may come as a shock to you that such a crappy plane could be spawned from the Athens of America, but keep in mind that we also gave y'all The Red Sox.